Nashik (Maharashtra), May 3 (IANS) Maharashtra’s well-known businessman-politician Pankaj Parakh called ‘The Man With The Golden Shirt’ by his friends – has earned a place in the Guinness World Records (GWR). 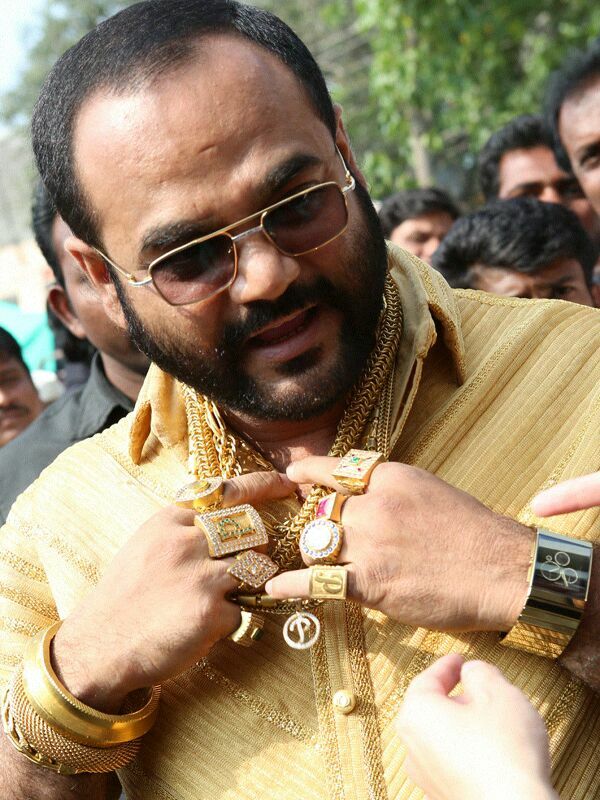 The GWR certificate issued on Tuesday cites Parakh, 47, as the man with “the most expensive gold shirt in the world costing Rs.98,35,099 ($161,354/GBP 95,856)” as on August 1, 2014. “This is simply unbelievable. I am a small man from a remote area in Maharashtra. I am happy that this achievement had catapulted my village name into the whole world,” an emotional Parakh told IANS on Tuesday. The school dropout, who made his fortunes from a garment fabrication business is also the Nationalist Congress Party’s Deputy Mayor of Yeola town in Nashik district, around 260 km from Mumbai. The shirt, weighing exactly 4.10 kg, is currently valued at over Rs.1.30 crore, is supplemented by other golden paraphernalia including a gold watch, several gold chains, large gold rings, a gold mobile cover and golden-framed spectacles – the total weight of this opulence being a whopping 10 kgs! Whenever Parakh steps onto the streets of Yeola in his full ‘shining golden gear’ and his licensed revolver worn discreetly, he admits that women stare and men glare at him, while two stern private security guards manage to keep everyone at a safe distance. “I had stitched this special gold shirt with seven golden buttons for my 45th birthday two years ago. I have been fascinated by gold since my school days and over the years it became a passion, almost an obsession,” Parakh smiled. The shirt was designed by Bafna Jewellers, Nashik, 85 km away, and meticulously executed by Shanti Jewellers at Parel in Mumbai. A team of 20 select artisans spent 3,200 hours over two months to craft the 18-22 carat pure gold strands, to the last thread and ‘stitch’ it, and the deal was fully billed – to keep tax sleuths at bay! Though made of gold, the shirt is fully flexible and comfortable, absolutely smooth and harmless and with a thin cloth lining the inside to avoid rubbing or chapping the body, washable and even repairable with a lifetime guarantee, Parakh said. Barely three decades ago, the poor, young Parakh could ill-afford his school education and dropped out after Class VIII to enter the family’s small garments business in Yeola. In 1982, he branched out to an independent business and a decade later even entered politics to be elected as a municipal councillor in Yeola. “At my marriage 25 years ago, many guests considered me an embarrassment as I wore more gold than the bride,” he recalled. Progressing and prospering over the years, he took care of all his family’s needs – a good house looked after by wife Pratibha and higher education for his two doting sons Siddharth (24) and Rahul (21). Then, he indulged in his passion and invested his excess incomes to acquire a ‘gilded edge’ that helped him enter the GWR. However, his unimpressed family does not share his passion for gold, they ignore it as ‘a necessary evil,’ but all his relatives think he has gone bonkers, Parakh guffawed. Parakh remembers how, when the entire family attends weddings or important social occasions, he adorns himself with around three-and-half kg gold ornaments while his wife looks bare and stark with just 40-50 grams gold jewellery! Yeola is renowned for its Paithani silk saris and the Shalu and Pitamber varieties of saris, considered nationally-recognised brands. Despite his gilt-edge, Parakh is a down-to-earth and caring human being, deeply involved in a variety of social and educational activities. For instance, he has fully financed 150 polio operations in the past seven years through the renowned Narayan Seva Sansthan Hospital of Udaipur in Rajasthan, the country biggest 1,000-bed polio hospital. He spends a week each year to offer voluntary services, financing poor patients, providing food, medicines and other requirements. Maharashtra has had other ‘gold-men’ including Datta Fuge of Pune, Jagdish Gaikwad of Navi Mumbai (Thane), the late Maharashtra Navnirman Sena leader from Pune Ramesh Wanjale, and to a certain extent, famed music director Bappi Lahiri of Mumbai.